Kommando worked in conjunction with PixAngels and Synergy to deliver the photo elements of the #GoGlasgow experiential at Glasgow Green, on behalf of SSE at the Glasgow 2014 Commonwealth Games. The #GoGlasgow campaign centred around an interactive hashtag installation where visitors could show their support for their home nation as well as athletes of today & tomorrow Feeding into the wider GoGlasgow campaign, the activation at Glasgow Green provided an opportunity for fans to capture a unique photo of themselves supporting their home nation in front of an interactive hashtag. Visitors to SSE’s experiential hub were greeted by SSE Energisers and then taken to a spot in front of the podium where they were snapped by PixAngels photographers. Fans were able to participate further by using flags and props specific to their chosen country. The PixAngels app enabled participants images to be instantly tweeted to the @GoGlasgowGreen Twitter Page with appropriate hashtags such as #GoScotland, #GoEngland and #GoWales. This meant that offline activity could be linked to what was happening online through social and media channels. 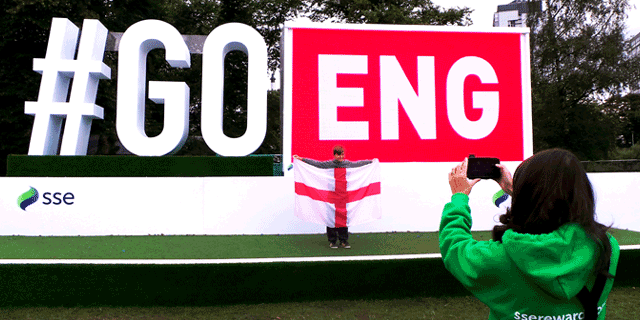 By tweeting support for England, Scotland, Wales or Northern Ireland, not only were fans supporting the athletes of today, they were also supporting the athletes of tomorrow as the home nation with the greatest number of tweets would win additional athlete funding for the SSE Next Generation programme in 2015. To further bridge the gap between offline and online activities, participants were gifted with branded wristbands and sent courtesy emails which contained codes that allowed them to view their images on the SSE branded photo gallery - and share them around the world on their own devices and across social media. PixAngels were also able to generate positive data capture live at the event, collecting vital information that would be utilised by SSE for future marketing initiatives. Votes for each nation were counted and then visualised in real time through the #GoGlasgow leaderboard – which also showed the leading nation. This digital leaderboard was hosted on the Glasgow 2014 website, SSE’s own website and Out Of Home media boards across the UK. Team Scotland captain and silver medalist Eilidh Child got involved in the activity, posing with fans in front of the #GOSCO. Fellow SSE Ambassador Sir Chris Hoy also joined in at Glasgow Green and helped whip up support. For more information, click the Find Out More tab below. Sign up to our monthly newsletter to receive exclusive news, alerts and offers straight to your mailbox. Thank you for signing up to Kommando's monthly newsletter. The monthly newsletter includes exclusive news, alerts and offers. Contact us to request our most up to media pack.